Springtime brings the loveliest distractions. We emerge from our grey cocoons of dormancy to find that everything is tender and beautiful. I find myself gazing longingly at blooms and shoots, feeling the coming abundance. Even though I have had a productive winter, I have ignored this space because it is so much easier to share works-in-progress on Instagram. I love the immediacy of capturing something on my phone instead of having to lug around my big camera and lenses. This spring we had lots of healthy green tips on our spruce tree. The new growth is tiny, tender, and green. The scent is unexpected, with only a hint of pine or resin. Instead the overwhelming scent is vegetal, bold, almost like fresh-snapped green beans. For me it is the scent of spring. Over the past few years we have used our spruce tips to make beer, vinegar, simple syrup, and snaps/schnapps. This year I wanted a quick project that would highlight their bright, fresh scent so I made a couple of small batches of spruce tip salt. The process is so easy that I find myself wondering what else can be made into flavored salt. My first salt experiment was last fall with red shiso made with shiso cullings and I was so pleased with the results. The first batch of spruce tip salt that I made was lovely jade green. I combined a handful of fresh tips with an equal volume of sea salt. I also added a couple of pinches of smoked alder salt. The second batch of salt tastes wonderful, but I made the mistake of adding a little Hawaiian pink salt, and the combination of lime green tips and bright pink salt made a most horrible color - kind of a puke pink brown. Perfect for enjoying at home, but not so nice for gifting. I am sticking with white sea salt. It is best to pick the smaller just-opened spruce tips in the cool morning hours. Choose from a tree that is abundant in tips, making sure to take them from different parts of the tree. Harvest only what you need, leaving as much on the tree as possible. The tips are the tree's new growth and will open up to become part of the branch. You can scale this up or down by using a 1:1 ratio of spruce tips to sea salt. Combine the whole clean tips and salt(s) in a food processor. Pulse until finely ground. Pour the ground salt onto a parchment or cloth lined tray. Let the salt mixture dry completely in a warm spot or in an oven set to warm. The color will fade some. Store in a covered jar. The scent and flavor of this salt is lemony and vegetal - a little more green beans than spruce tree, but it really adds the scent of spring. I love it on fried or scrambled eggs. The scent pops when sprinkled on warm dishes of spring vegetables, potatoes, or fish. Add it to anything that could use a dash of bright spring flavor. It is magical on avocado toast! It is late spring here and the garlic scapes are ready to harvest, the peas are in bloom, and the hop vines have already reached the top of their trellis. But what we are most excited about is the strawberries. We have only "harvested" a couple of seascapes and one alpine, but it has whet our appetite for things to come. We celebrated Mr. Graham’s birthday last week. Isn't he lucky that his birthday coincides with the arrival of strawberries? When I asked him what kind of cake he wanted, he said that he wanted something with strawberries, perhaps a tart. I considered making my grandmother's sunshine cake with layers of whipped cream and berries, but then I remembered a dessert that his Aunt Edith made when we visited on our honeymoon, a marengskage made with whipped cream and Danish strawberries. You may be thinking, "who goes to visit family on a honeymoon?" As it happens, it was the highlight of our trip. As beautiful as it was traveling on a boat in the fjords or walking along a continental divide at Þingvellir, I loved spending a few days with Mr. Graham's family. His Aunt Edith made us so many wonderful meals and it was nice to relax and enjoy the first days of married life. We packed in too much adventure in a short amount of time. We traveled to Iceland and then to Denmark and Norway. Instead of relaxing and enjoying midsummer, we went to a lot of amazing and quirky museums. We love a good diorama -- and the cake and coffee with chicory at the Worker's Museum in Copenhagen is not to be missed. But who goes to a leprosy museum on their honeymoon? The Grahams do. Enough morbidity, let's talk about marengskage, a much happier subject. Marengskage is a meringue cake, a cousin of pavlova. It is easy to make, and is the perfect blend of crunch, cream, and fruit. I was instantly smitten by its beauty and simplicity. It is the perfect vehicle to highlight the wonder that is a Danish strawberry. They are some of the best berries in the world. We may not have Danish berries in Portland, but we do grow some really good alpine strawberries in our backyard. Strawberries are easy to grow and don't take too much attention or real estate. Our berries were not ready, but luckily Viridian Farms grows some of the best strawberries around and they deliver to our local market. This cake doesn't keep well, but you can layer the cake to serve a few or a crowd. This recipe makes several meringue layers so assemble as many layers as you want. The meringues will keep for a few days, so you can store them until you are ready to serve. This cake doesn't keep well once assembled, so make only as much as you will eat in one sitting. This makes a 9 inch, 2 layer cake. I use organic cane crystals and they lend a slight caramel color and an earthy cotton floss flavor to the meringue. I keep my meringue simple with only whites and sugar, but you can add 1/2 teaspoon of vinegar to prevent over-beating of the eggs. Also, a couple teaspoons of corn starch may be added to prevent the meringues from weeping. I bake these meringue layers until they are crisp all the way through. 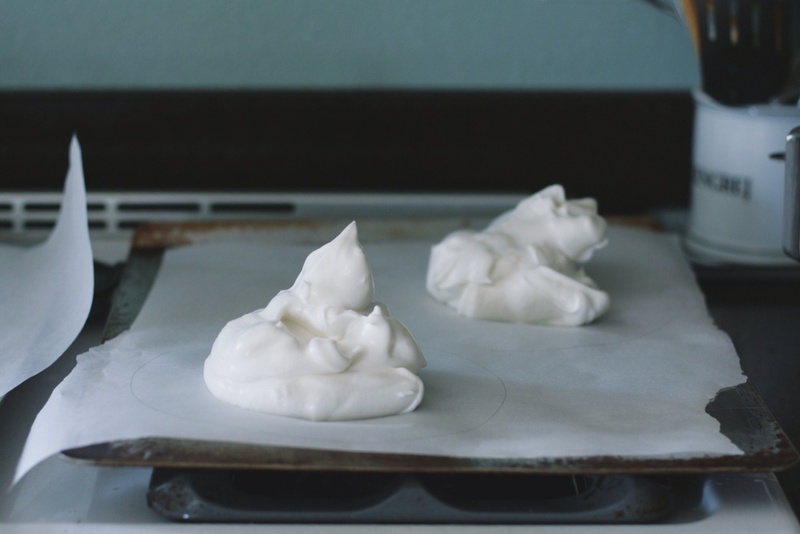 Also, avoid making meringue on rainy or humid days, it just won't work. With all of this in mind, don't be intimidated by the process, it really is easy, and the results are delicious. Heat the oven to 250 degrees F. Place sheets of parchment on baking trays. Draw two 9” circles with a compass or trace the bottom of a 9 inch cake pan. Turn the parchment over, so the ink or pencil is on the other side. Beat the egg whites (with vinegar or cornstarch, if desired) until soft peaks form. Add sugar and beat until peaks are stiff and dry. Spread the whites evenly in the parchment circles. Alternatively, you can pipe the meringue with a pastry bag for prettier presentation, but I like the rustic look. Bake the meringues in the middle of the oven for 45 minutes to 1 hour. Once they have cooked for 30 minutes, check on them every 10 minutes to see if they are ready. Cook them until they are just barely golden. Once they are done, turn off the oven and allow them to cool inside the oven for an hour. The meringues will keep at room temperature for a few days, as long as they are in an airtight bag or container. With a whisk or a stand mixer, whip the cream until it starts to thicken, then add the sweetener. Whisk until just whipped. Fold in vanilla extract. If refrigerated, the whipped cream will keep for a few days, but may require a few whisks to freshen it. Variations: If you have some elderflower blossoms, you can steep the heavy cream with the flower crowns overnight in the refrigerator. In the morning, strain and proceed with the recipe. 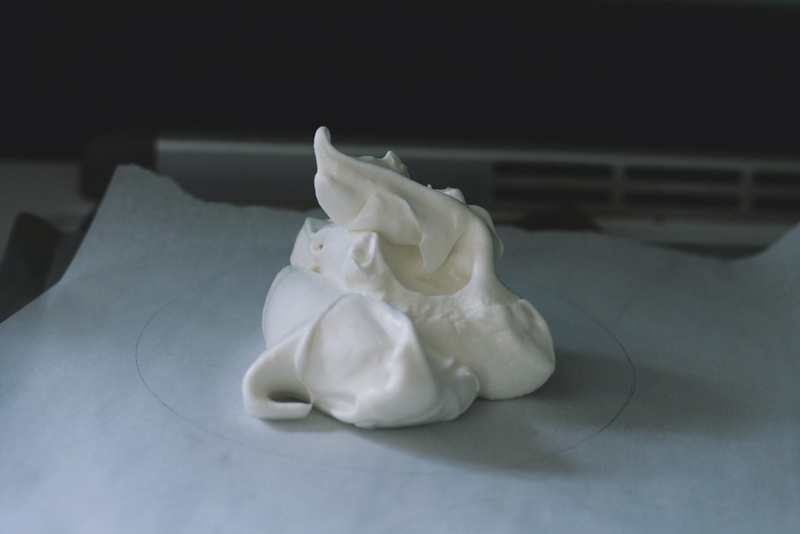 Sometimes I like to add a sour edge to the cream by folding a few Tablespoons of crème fraiche or sour cream into the whipped cream. Place a layer of meringue onto a plate. Generously spread whipped cream over the meringue. Top with berries. Add another layer of meringue, whipped cream, and berries, if desired. Or save the extra meringue, cream, and berries to make another cake tomorrow. This cake doesn't really need a garnish, but you can make it extra festive and flavorful with a few fresh herbs like mint or tarragon; or edible blossoms such as strawberry, chamomile, borage, or thyme. PS - What do you do with the yolks? Make homemade pasta. The noodles in the Toro Bravo cookbook are especially good and easy. This recipe is so flexible, I made 3 rounds of meringue - 7" each.